Having a hard time getting your class to walk quietly in the hallway? Ever feel like you have to constantly stop and wait for everyone to be standing in a straight line? 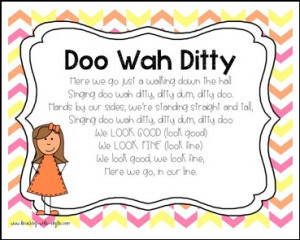 Here you will find fun songs to sing or chant with your class to get them ready to walk quietly and respectfully in the hallway. Included are small posters to create a book. I hole punch mine in the top left corner and attach with a binder ring. There are also large page-sized posters that you can laminate and post by your door. Lots of options to help your class be successful in the hallway!